Hello everyone. I see some posts here of people looking for advice on which tablet to buy, so I thought, why not posting a review of a great product that I got lately? I hope this is not against any forum rules, I'm just reviewing a product that I bought with my money and I just wanted to have some fun writing it, I hope this can help someone out there looking for a good option with an eye on the wallet =). The Deco 02 is a sleek tablet with a matte finish and a great paper-like feeling while drawing. The Active area is 10 x 5.63 inches (25,4 x 14,3 cm) , so it’s actually bigger of some products that can easily cost much, much more. It has 6 buttons and 1 scrolling wheel. Every button can be remapped to the functions you like, and you can give the wheel up to 5 different functions, like increasing/decreasing brush size, zooming, rotating, etc. The ring is smooth and glossy but, if you like, you can put a rubber protection over it to increase the grip and control (included in the box). The connection is USB type C, so it can be plugged in either way. That’s great, because the tablet design is symmetrical and can be easily flipped for left-hand users. The Pen is one of the most distinguished features of this tablet. There’s a cilinder in the box which functions as slipcase for the pen and storing for the 8 replacement nibs included. The shape of the pen is exagonal, with a rubber grip, made to feel like a traditional pencil shape. The ergonomics is really great and you can use it comfortably for hours. It has a single programmable button and, surprise surprise, an “eraser” tip on the other side! 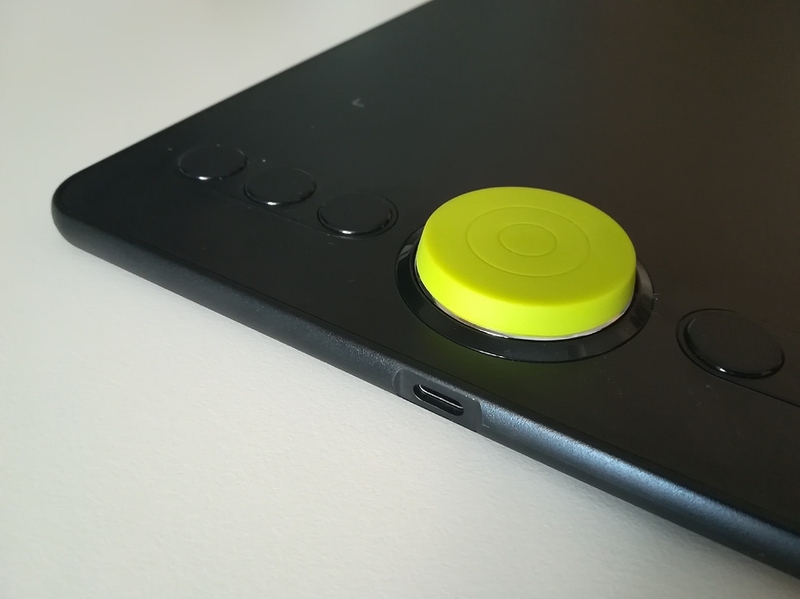 There are very few tablets that still retain this feature. I tested it in Photoshop and it works fine. Personally, I don’t use it much, because I prefer to use the eraser hotkey instead, but I know this is an important feature for many people and if you like it, well, it’s here. The tablet has 8192 pressure levels and, I can assure you guys, you can actually feel all of them :). The pressure curve is really smooth, but you can easily adjust it to suit your tastes (more on that later). Strokes come out very precise, lines are smooth and weighted exactly as I want, even if I’m not using things like line stabilization. No sign of jitter or discontinous lines, pen performance is basically perfect. A word on drivers: the control panel is very complete and you have all you need in a nice compact window. 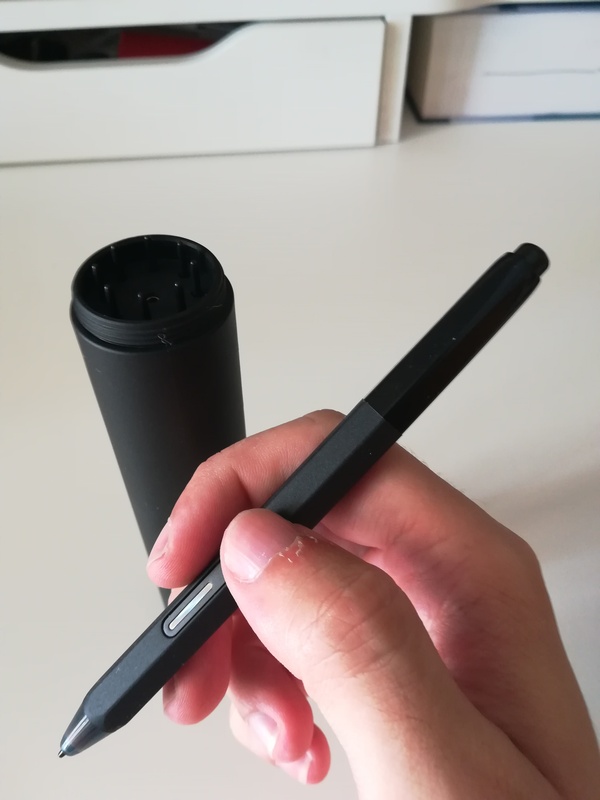 You can change the buttons functions, select the monitor correspondence, you can even shrink the active area if you want, for those who like to draw with the wrist. You can see the pressure curve on the left and you can actually change it to suit your tastes easily by dragging the blue line. The curve you can see up here is my favourite, because I have a very light hand and I don’t like to press too hard to get the maximum values. You can set different functions on the buttons for different programs (like PS and CSP), and the drivers can memorize the functions. When you open the programs, it automatically detects which software you’re using and you don’t have to change anything, you can dive straight into drawing. Handy! I tested the tablet with Photoshop CC, Clip Studio Paint, Krita and Mischief with no issues, all programs function normally. Price/performance: the ratio is really impressive, expecially for someone like me used to a tablet which costed x5 the price of the Deco 02. It’s perfect for beginners and amateurs, but can be easily used for professional work with no issues. Drawing performance: I really can’t find any issues with it. The tablet is precise and reliable. Lines come out exactly as I want them to be, and if you’re like me and use lineart a lot, that’s really important. Drivers / support: Drivers are complete and stable, you can easily tweak every aspect of the tablet functionality to your likings. 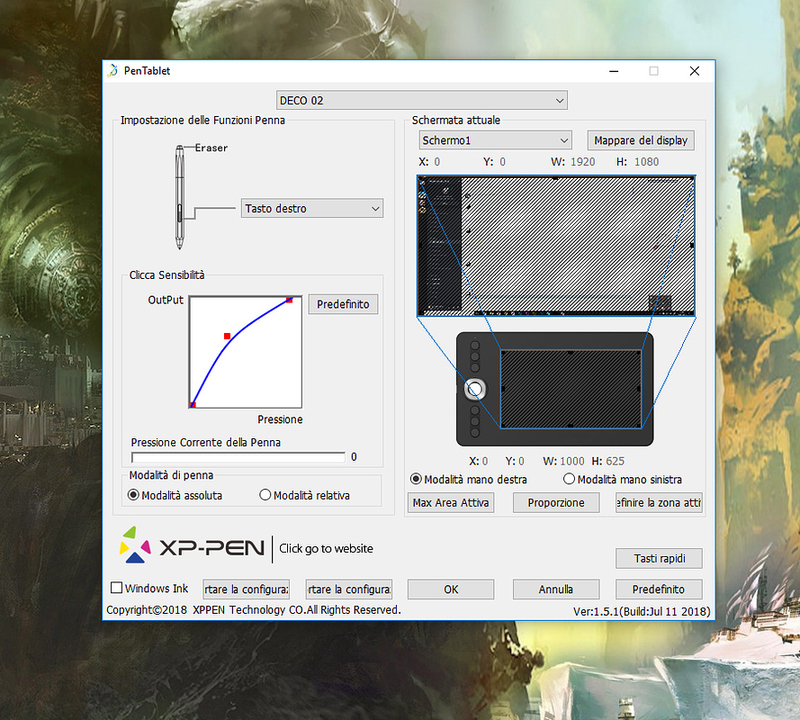 Xp-Pen releases a new version of the drivers quite often, I think 4 times only this month XD. According to my experience and my friends who are clients of this brand, they’re quick to respond to any technical issues. Cons? : I really had to think hard to find any. I guess the only complaint that I have is the design of the single pen button, which doesn’t protrude from the pen so it can be a bit difficult to find by touch sometimes. But it’s the only minor complaint over a really really solid tablet. Thanks for sharing your review with us! It sure was an interesting read, even for me as a loyal Wacom user. Do you happen to know if the pen works with a Wacom Cintiq as well (just curious). I'm sorry but I?m 100% sure that the Pen won't work on a Wacom product... they use a different technology =). I was a "loyal" Wacom user too, then realized that 1)Monopolies are very bad for us consumers and 2)The budget option from Wacom are WAY overpriced for what they offer. This is cheaper and superior in basically every way to the Intuos baseline. Honeslty, if someone asks me what cheap tablet to buy today, I'd answer this one ( or one from this series) without a doubt. Thank you for the review! Very detailed and helpful to people looking for a good tablet! Oh, and I just pretend I didn't hear you insulting Wacom tablets. Haha. 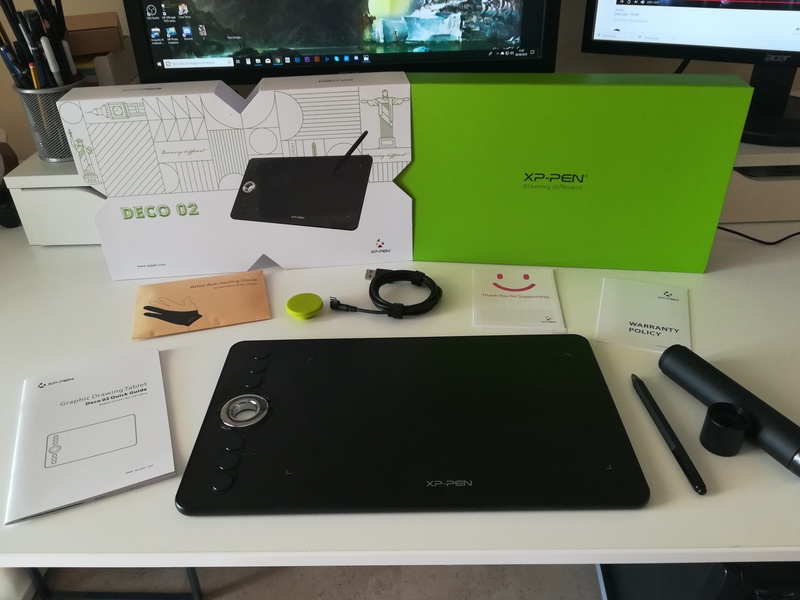 As I said in the review I had one, and I think that the top line, the intuos pros and Cintiqs are very good, but have a very bad price/performance ratio. I think that Wacom took advantage of his position for too long, but luckly the alternatives are finally here =). I also have a screen tablet from Xp-Pen, an Artist 15.6 and I love it, maybe I'll post another review for that one later. I think it depends on which product you use and which fits you best. Like clothing not every piece fits every person. Personally I really dislike the Intuos and can't draw at ALL with it. 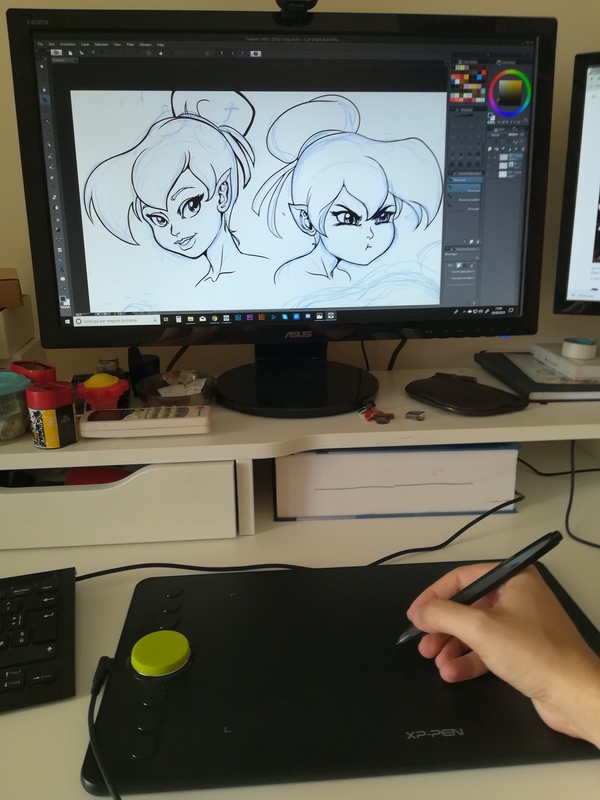 Cintiq is okay for me but the Mobile Studio Pro truly is heaven! It suits me perfectly and feels like drawing on paper. It's expensive but because it's a tablet computer, I use it for work, homework and my art. Haven't used my laptop in 2 years now. But I can see how not everyone would agree. It's very personal and up to what you are looking for in a product.